Fanny Burney's wickedly funny satire follows the trials and romantic adventures of the young and beautiful Evelina as she tries to make her way through 18th-century Britain handicapped by her three great problems: being poor, being illegitimate - and being a girl. Evelina was a raging best seller when it was first published in 1778 and is widely credited with being the first of the great British domestic novels. Burney was a direct influence on her immediate follower, Jane Austen, who used some of the final lines from Burney’s novel Cecilia for one of her own fairly successful novels: "...if to pride and prejudice you owe your miseries...to pride and prejudice you will also owe their termination". I decided to get this version of Evelina due to the poor reviews that the other recording receives from Audible UK listeners. It was a good choice! Make sure to listen to the audio samples of both. The cast here is fantastic. Evelina is a charming novel with some unforgettable comedic moments. Now if only Audible would also record Cecilia & Camilla! This was an amazingly complex witty and astonishingly relatable considering the time period. No one could have performed the innocence of Evelina as well as Finty Williams. Not to mention the way she captured the secondary and tertiary characters. I relished in the romantic diction of this book! First I must comment on the great narration! 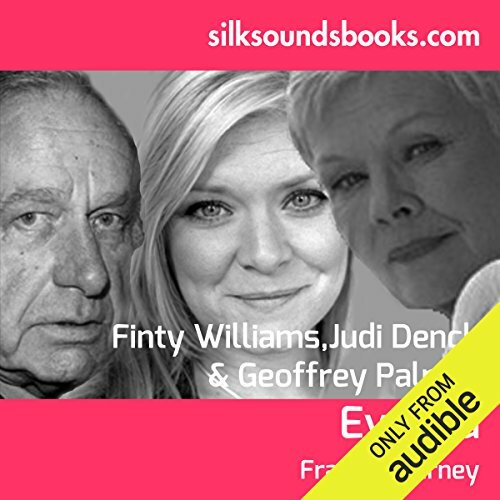 The only one of the trio I was not familiar with was Flinty Williams who did a marvelous job as Evelina as a young woman! The book, I believe, is set during the regency period. At that time people wrote many letters often of some length. That is the means via which our story is moved. Our heroine, Evelina, has been raised in the country by a parson in who's care her dying mother entrusted. She is well educated by him and, we learn, very comely though very innocent as she enters London's society. I found the novel to be more a coming of age story than a love one. If you are interested in the times and manners of the period, as well as how people wrote and spoke, you should find this story most enlightening and enjoyable. A period piece.. Flowery and sophisticated use of the mores and morals of the time. One wonders that human communication at one time had such a rule bound and structured manner, as well as behaviors. A bit long. One wishes Evelina could have surpassed her challenges with a little less digression. Poor girl makes good. Excellent reading. One needs a lot of patience with this book, which is understandable bearing in mind the century it was written.